How do you carry a grief that seems larger than the world? We carry it in a really strong container. Grief, loss, and trauma are some of the most difficult experiences imaginable and possible. When you have experienced loss so profound there is no “getting over it,” you can learn only how to hold and to carry it. Join author, psychotherapist, and yogini Karla Helbert for a time of solace and connection in a retreat space of both learning and experience during Yoga for Grief and Loss. Explore how the koshas (layers of being) and chakras (energy centers) are affected by experiences in trauma, grief, and loss. Together we’ll come to more deeply understand how the ancient paths of Yoga can help us bear what grief, as well as life, asks of us. 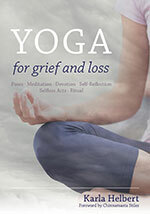 Karla’s book, Yoga for Grief and Loss, is available for purchase online at Integral Yoga Distribution by clicking here.